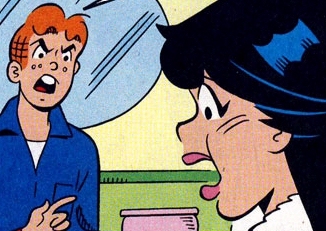 Archie explains to Jughead about that girl "whose dad was loaded," and before long she's telling him "I want to live like common people...I want to sleep with common people...."
Veronica never got a smackdown like this before... It's a mashup of the lyrics to the subversive Pulp song "Common People" with the hopelessly square comic strip Archie. I wish more people on the net would do stuff like this.